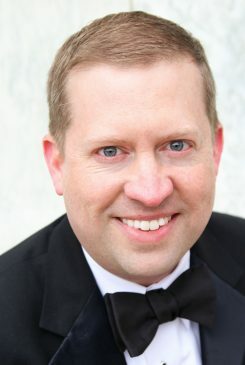 With over one hundred fifty appearances across the United States, Dr. Andrew Minear is an active conductor, choral clinician, adjudicator, and presenter. Recent or upcoming conducting engagements include the National Concert Chorus in Carnegie Hall, Music and Worship Arts weeks in Lake Junaluska and Montreat, and all-state choirs in Alabama, Florida, Georgia, Kentucky, Louisiana, and Mississippi. He has conducted multiple summers at the Blue Lake Fine Arts Camp in Michigan and led the Florida Ambassadors of Music on performance tours of Europe. Dr. Minear’s choral directing experience includes university, high school, middle school, children’s choir, community choir, and both youth and adult church choir settings. Dr. Minear is passionate about educating the next generation of choral singers and conductors. In 2016 he was appointed as the Director of Choral Activities at the University of Alabama where he leads the university choirs, oversees the graduate choral conducting program, and teaches courses in conducting and choral literature. After Dr. Minear arrived at UA, choral enrollment doubled, a graduate conducting student won recognition as a masterclass participant at the Southern Region ACDA conference, and the UA University Singers performed at the Alabama Music Educators Association conference. Major works have included Bernstein’s Chichester Psalms, Bach’s Missa Brevis in A, Mozart’s Requiem, and in 2019 the southeastern premier of Jocelyn Hagen’s brand-new multi-media work, The Notebooks of Leonardo Da Vinci. Prior to joining the faculty at the University of Alabama, Minear pursued a doctorate degree in choral conducting at Michigan State University. He served as the director of the MSU Campus Choir and assistant director of the MSU Men’s Glee Club. Under his leadership, the Campus Choir increased in size to over eighty singers and performed their first choral-orchestral work, Borodin’s Polovetsian Dances, with the MSU Concert Orchestra. Michigan State University named Minear a University Distinguished Fellow, and his doctoral project was a study of Graduate Choral Literature Curricula and Pedagogy. Over the course of a twelve-year career in the Orlando-area public schools, Andrew Minear taught middle school and high school Chorus, Music History, Keyboard, Musical Theater, and AP Music Theory. During his six years as Choral Director at Dr. Phillips High School, home of the Visual and Performing Arts Magnet for Orange County Public Schools, the Chorus Department grew from 100 to over 240 singers. The DPHS Concert Choir performed with the Orlando Philharmonic Orchestra, and Minear’s students were selected over 180 times for All-State and ACDA Honor Choirs. Cora Bella, the advanced women’s choir, performed to acclaim at State (2011), Southern Division (2012), and National (2013) Conferences of the American Choral Directors Association. Dr. Minear holds memberships with the American Choral Directors Association (ACDA), Chorus America, the College Music Society, the International Federation of Choral Music, the National Collegiate Choral Organization, the National Association for Music Education, and the Royal School of Church Music. He currently serves as the Alabama ACDA Repertoire and Resources Coordinator for College and University Choirs and coordinates the Alabama ACDA Collegiate Choral Festival. In the past, he served as the Student Membership Supervisor for the Michigan School Vocal Music Association, the Florida ACDA Repertoire & Standards Chair for Senior High Choirs, Women’s Choirs, and Children’s Choirs, as well as District 8 Chair for the Florida Vocal Association. He coordinated district and state honor choirs in Florida and served on the Orange County Choral Leadership and Curriculum Writing Teams. Dr. Minear has attended conducting workshops with Rodney Eichenberger, Simon Halsey and Helmuth Rilling. He was recognized as a finalist for the 2015 American Prize in Conducting. Dr. Minear received his Doctor of Musical Arts degree in choral conducting from Michigan State University where he studied with Dr. David Rayl, Dr. Jonathan Reed, and Dr. Sandra Snow. He received his Bachelor of Music Education and Master of Music Education from Florida State University where he studied with Dr. Judy Bowers, Dr. Kevin Fenton, and Dr. André Thomas. For more information or to be in touch, visit www.andrewminear.com.